Beginning September 2016, the Crusader began running primarily as an online newspaper. Integrated with ALJ's social media pages and revitalized website, the Crusader entered the realm of digital news. 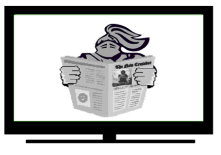 In addition, news stories from ALJ TV will be included and linked whenever possible to the written stories and pictures, so the page is a blending of the Crusader Newspaper and ALJ Today. Thus Crusader Today is born. Our stories are posted as they are finalized. This approach maintains a relevant and timely multimedia news source at all times. While most of the stories will be written by our lively and dedicated student writers, the newspaper also includes press releases, NJ.com stories, and Tapinto articles. Stories from ALJ Today will be posted to the ALJ TV YouTube channel as well.